even St. Patrick's Day Parades, St. Pat and St. Paddy. Remember as you celebrate this great saint that he was a real person. He is the patron saint of Ireland and many celebrate his day as a Holy day. His day is March 17. On to the Main Menu. This page has been provided as a donation to the world by Hutman Productions Please visit our main web page to learn more of how we serve the world via the internet just clickit right here! Legend says that it was here that the saint rang his bell and the snakes of Ireland fled. References in the Annals of Ireland- the Most important early history of Ireland. He raised them from the ground." No Penance was greater than his penances." Innumberable also was the number of signs and miracles he performed; by resuscitating the dead from death; by curing lepers, and the blind, and the lame, and people of every disease in like manner. Two years and six socre was his age when he resigned his spirit in the year 493. Bishop Tasach was he who gave the body of Christ to Patrick. The Egyptian "Coptic" Orthodox Church was one of the first established Christian Churches, together with the Churches of Jerusalem and Antioch. In the first centuries of Christianity, the Egyptian Church was very active and was working to spread Christianity, beyond Egypt. Egyptian monks and laymen, were everywhere. This was well documented by historians and the history of the church. A community of Coptic monks went to Gaul where they founded a community on an island called "Lerins" in the Mediterranean Sea . The island was nearGaul. David Marshall, Ph.D. of the University of Hull, England, has written a book which discusses the strong connection between the St. Patrick and the Coptic Monks in Lerins. In "Liturgics" Fr. Dmitri Ross, OSJ . SSBM. MA. Th. L. EM; discussed the Celtic Church. Fr. Dmiti Ross, of St. Dunstan of Canterbury Orthodox Parish, Cromwell, New Zealand, also has written of how monasticism strongly influenced the Celtic Church and was a reason for its quick success. Ross tells how monastisicism came to the Celtic Church from the Egyptian Church, "Coptic Orthodox Church of Alexandria". The connection came through Gaul,( France), where a good number of Egyptian monks were living including those in the Monastery at Lerins. During this time , there were not many Christians in Ireland and the British Isles in general, but Christianity was foundt there that is, before the time of St. Patrick. The writers and philosophers, Origan and Hippoluus of the third century, wrote that of those who attended the First Ecumenical Council, "Nicea Council", there were people from the British Isles. This was also recorded by St. Athanasius himself who was an Egyptian deacon and a key organizer of that council. He introduced the "Orthodox Creed", at that council, and also defended the faith against Arianism. Athanasius was later the Pope of Alexandria. Island of Lerins, where the Egyptian Coptic monks lived. St. Patrick lived with these monks learning the "Coptic Christianity of Egypt". The Coptic Church originated directly from the Church of Jerusalem, rather than from Rome and was also not like the Byzantine Church. Dr. David Marshall writes that the "Celtic Christianity owes something to the Copts." Patrick's residency with the Coptic monks on the Island of Lerins, "accounted for his independence of Rome. 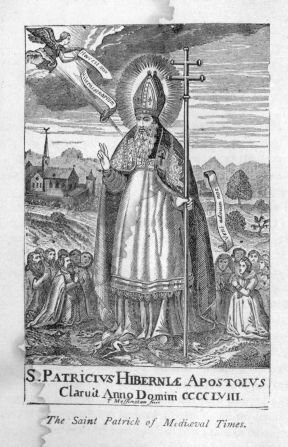 St. Patrick prefered follow true orthodoxy. Patrick returned eventually to Ireland. 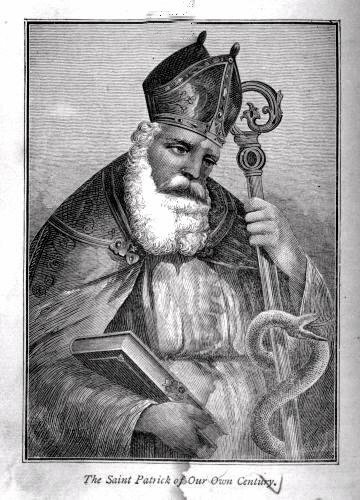 Amator Bishop Auxerre ordained Patrick a priest and the church prospered during his life. After the death of St. Patrick Rome turned against the Celtic Church, because he had organized it according to Coptic teaching. Were in the Liturgy and Baptism because the Egyptians followed the Church of Jerusalem and not Rome. Bishops officiate in vestments of oriental character: in gold and silver. fasting occurs on Wednesdays and Fridays. Daily prayers, Mattins, Vespers etc. Monks stay in separate cells. These are known as the rules of "Columba". Rome held these practices to be unacceptable Irish customs and strongly attacked the Celtic Church. Rome was worried about the rapid growth of the Celtic Church in Ireland and Britain and its expansion to Europe. The Roman Pope sent Augustine and eighty Benedictine monks to the south of England in order to counter the Celtic movement. By mid 598AD, Augustine had established a base in Canterbury. Thousands from the Celtic Church were rebaptized again- in the Church of Rome. Every year many thousands of pilgrims, many in bare feet, climb the 2,500feet to the peak of Croagh Patrick, to celebrate Saint Patrick's Christian mission in Ireland. 4. Patrick is thought to have been born and died on his feast day, March 17th. Unlikely! exercise our faith more than our knowledge. 1. St. Patrick was born in North Britain, near the Clyde, . . . 376 or thereabouts. 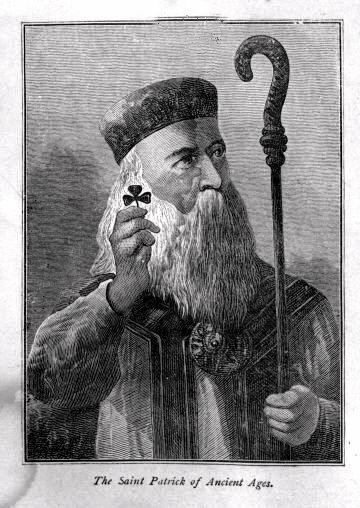 Some chronologies extend the life of St. Patrick by fortyor forty-five years. First, the St. Patrick's Cross, as it is termed, incorporated in the Union Jack, is of comparatively modern introduction as the national cross. When the Knightly Order of St. Patrick was established in 1788, the red salitre on a white field charged with a trefoil, was adopted as the badge or device of the order. The Royal Irish Academy adopted the same cross charged with a royal crown, and the Royal Society of Antiqualies followed suit by adopting the red saltire, with the arms of the provinces in the four quarters. As to the reason of the adoption of this form of cross, it is »imply the arms of the Fitz Geralds, Dukes of Leinster ; and on the legislative Union the red saltire adopted by the Order of St. Patrick was naturally and appropriately joined with the crosses of SS. George and Andrew, funning a trio of the three national saints. I have been unable to trace the adoption of the red saltire to an earlier period ; undoubtedly the shield of "Ireland's only Duke" met the requirements to perfection! As an instance of its (St. Patrick's Cross) modern adoption—Cromwell abolished all the royal emblems on the Seal of the Commonwealth, and in plaae of the Plantagenet and Scottish emblems, adopted the crosses of St. George, first and fourth ; St. Andrew in second quarter ; but for Ireland— the Harp, clearly showing that the red taltire was not known at the time.-The Journal of the Royal Society of Antiquaries of Ireland, Royal Society of Antiquaries of Ireland, The Society, 1903, p.416.